Studer Innotec SA was founded in 1987. Today, Studer Innotec SA is one of the world leaders in the inverter market. Thanks to its exceptionally extensive products range, it is the only inverter manufacturer able to collectively cover the solar, nautical, mobile, backup and telecom markets. Studer Innotec high-tech concept of its products as well as the choice for performance and reliability drive Studer Innotec SA to choose its components with the greatest care. This the reason why the company has choosen the latest technologies, such as the digital signal processors that provide higher efficiency to its inverters. Security and comfort (lighting, heating, household appliances, leisure electronics, telecoms...) can now be provided by autonomous energy systems; when far away from any electrical grid, either by choice or reason. These systems consist firstly of an energy source; normally a genset, a solar generator, a wind turbine or a combination of these. Secondly of a battery storage, and then thirdly of devices (inverter-charger, battery charger) able to charge the battery from this energy source and to supply users with AC voltage (inverter, inverter-charger). An inverter/charger with transfer relay or a combination of an inverter and a charger guarantees that the battery is well maintained and that an uninterrupted power supply to strategic appliances is sustained. Studer Innotec offers solutions from 200 VA up to 72 kVA with a one of a kind product choice that remains unchallenged on the market. A simple on-board energy system is often necessary to power AC voltage appliances, while a vehicle or a boat is away from the electrical grid (port, garage, camping...). In this case, the energy is stored in the battery, which is actually charged by power sources on-board, such as a genset, solar generator, wind turbine, alternator or a combination of these. Studer Innotec offers the product range that secures the management and conversion of this energy, while securing an optimal power supply to the on-board appliances. The political decisions recently taken in Germany tend to show that the photovoltaics enters a new stage. The decline in feed-in tariffs (FIT) for injecting solar current into the grid gives full sense to self-consumption of this current, especially since the self-consumption is remunerated. 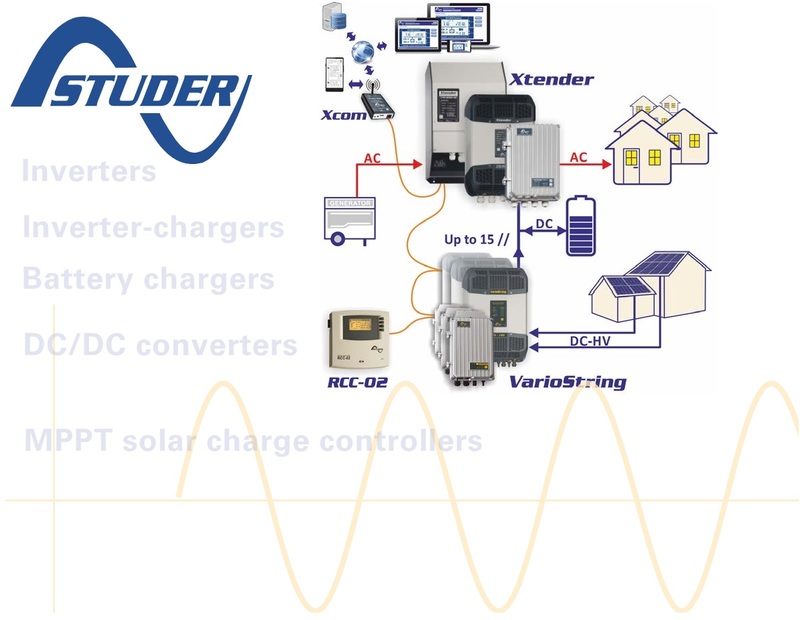 Various systems meant to optimizing the self-consumption have been developed while integrating our inverters of the Xtender series, and are already available on the market. For all industries requiring a reliable and uninterruptible computer system, or that must secure the end of each process of their machine tools, etc, Studer Innotec offers global backup solutions. From the process keeping to hybrid electrification of the transmission relays or emergency lighting systems, the Studer inverter/charger range offers solutions from 200 VA to 72kVA.